I had only bought fresh coconut once in England years ago and it was a waste of time, the coconut was off and it ended up in the bin. Had been thinking about fresh coconut again lately and how many recipes I can use it for. On Saturday, I saw some tiny coconuts in Morrisons, took the courage and bought one. Took it home and crack it, was really surprised to see it was really fresh and the coconut was pure white. 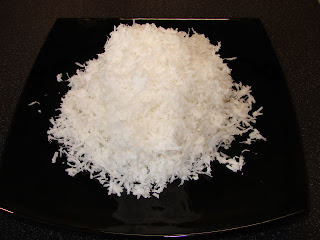 Within half an hour I had a white pile of freshly grated coconut. Was really pleased and will be buying more coconuts from now on. Select a coconut that does not look moldy on the 3 eyes (top of the coconut). Give it a sniff if it smells sour, put it back. Make sure the coconut is quite heavy and shake it to ensure there is still water inside. To crack a coconut, hold the coconut in one palm and the other hand using the back of a chinese cleaver tap hard on the middle of the coconut till the shell cracked. Do this over the sink to allow the water to spill out. Continue tapping along the crack till the whole coconut is broken into half. Crack the coconut halves into few pieces. Use a hammer if you want to but I just tap it with the back of a cleaver. Using a blunt knife dig out the white flesh. Big chunk if you can. Use a sharp small knife peel off the brown skin on the underside of the flesh. Grate the coconut with a Microplane, medium or fine. 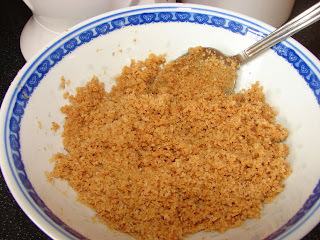 I made kerisik (Malay toasted coconut) with the grated coconut. Kerisik is a common cooking ingredient in malay dishes like Beef Rendang and Nyonya cooking such as Kerabu Mee Hoon (Nyonya rice vermicelli salad). To make kerisik, first roast the coconut in a dry pan on medium low heat and stirring all the time for about 20 – 25 minutes till golden brown. (if the coconut is very hot and turning brown too quickly, turn the heat down to minimum). Here is the result. While it is still warm, blitz the coconut using a food processor or mini blender till very fine like this. 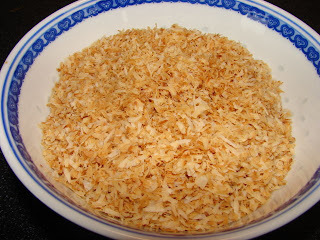 ** If you don’t get fresh coconut you can use desiccated coconut.